If you lose power for several days - or longer in case of a major disaster - a well insulated house will remain habitable for a longer time. In the winter, if you invite a few people over their body heat will help keep your house more comfortable. Of course, knowing your neighbors beforehand will make this easier! The Energy Trust of Oregon will provide a free Home Energy Review and offers incentives for doing the work yourself - their weatherization standards are here (PDF) - and resources if you want to hire professionals. And be sure to check out Clean Energy Works Oregon for additional resources. Here are some suggestions on where to start, based on EnergyStar.gov. 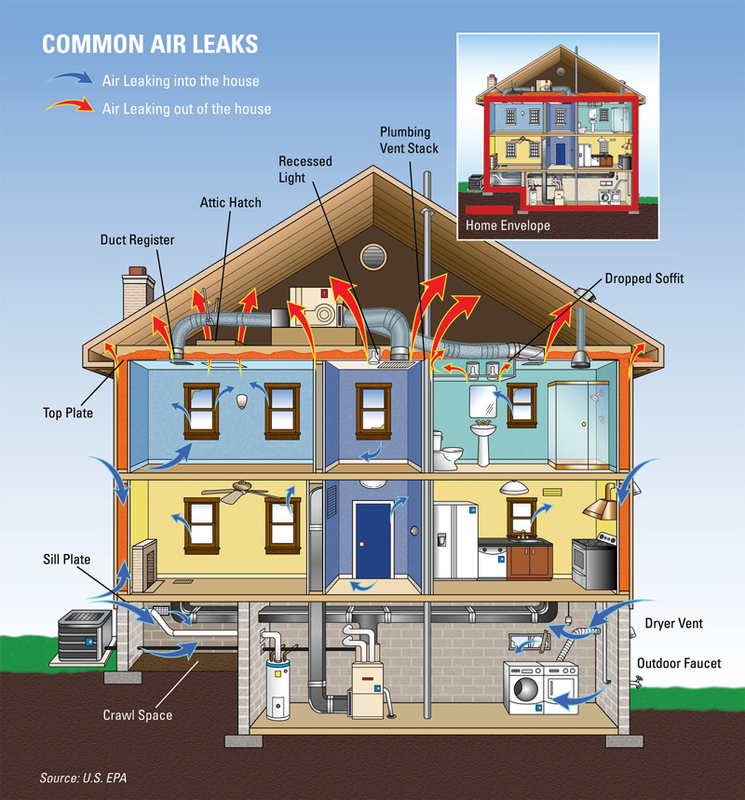 Many air leaks and drafts are easy to find because they are easy to feel — like those around windows and doors. But holes hidden in attics, basements, and crawlspaces are usually bigger problems. Sealing these leaks with caulk, spray foam, or weather stripping will have a great impact on improving your comfort and reducing utility bills. 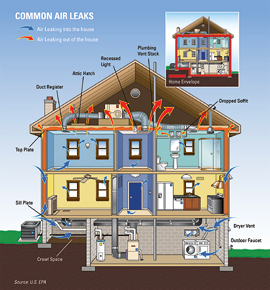 See the house diagram below to see common air leak locations that you should aim to seal. Air that’s heated or cooled to comfort you and your family shouldn’t be pouring into your crawlspace, attic, walls or other uninhabited areas. That’s why it’s important to make sure your ducted heating and cooling systems aren’t leaking, which wastes energy and costs you money and comfort. After any home sealing project, have a Home Performance Contractor check to make sure that your combustion appliances (gas- or oil-fired furnace, water heater, and dryer) are venting properly. Be sure to have a carbon monoxide detector properly installed. For additional information on Indoor Air Quality (IAQ) issues related to homes, such as combustion safety, visit EPA’s Indoor Air Quality Web site. Insulation keeps your home warm in the winter and cool in the summer. There are several common types of insulation — fiberglass (in both batt and blown forms), cellulose, rigid foam board, and spray foam. Reflective insulation (or radiant barrier) installed in the attic is another insulating product which can help save energy and increase comfort on hot, sunny days. When correctly installed with air sealing, each type of insulation can deliver comfort and lower energy bills. For more comprehensive information, check the Department of Energy’s online Insulation Guide. Properly insulating your attic/ceiling and floors keeps you comfortable throughout the year, reduces outside noise, saves energy and reduces your heating and cooling costs. It’s also one weatherization technique many homeowners can tackle themselves—provided you have the right insulation materials, protective clothing and how-to information. Before beginning an insulation project, it’s a good idea to have an experienced contractor perform an air leakage test and seal any air leaks in your home.